The 100sqm apartment is located on the ground floor and is only about 80m away from the beach. This can be easily reached via the private beach access, which belongs to this apartment. The city center with shops and restaurants can be reached in about 650 meters. 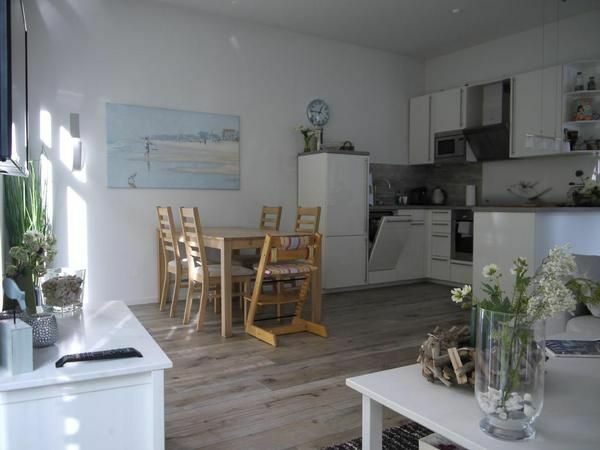 The apartment with underfloor heating impresses with its high quality and comfortable facilities in the beach house style. The living room is furnished with two white new leather sofas, a 48-inch flat-screen TV with satellite connection, DVD player (Blue-ray) and radio. Furthermore, the apartment has a large children's room with day bed (0.80 x 2.00 or extendable to 1.60 x 2.00, Rausfallschutz available), loft bed (0.90 x 2.00) and toys, a master bedroom with a 1.80 x 2.00 large bed and wardrobe, a garden with a large terrace, patio furniture for up to 6 people, beach chair and barbecue (the garden will be redesigned this spring and receives a large sandpit), a daylight bathroom with walk-in Shower and two sinks and a large guest toilet also with natural light and large sink. Also includes two parking spaces, two 28 inch bikes, a washer and dryer, beach toys and free Wi-Fi, of course, to the apartment. Children's travel cots, a fall protection and two high chairs (TrippTrapp) can be provided free of charge. Intermediate cleaning: once per object costs in the amount of 70 EUR (optional). Towels: to rent once per person for 5 EUR (compulsory). Visitor's tax / tourist tax: per person and day costs of 1. 7 EUR (obligatory). Internet (per object and day, included in the price 0 EUR). Parking (per object and day, included in the price 0 EUR). Intermediate cleaning (once per object, costs in the amount of 70 EUR).